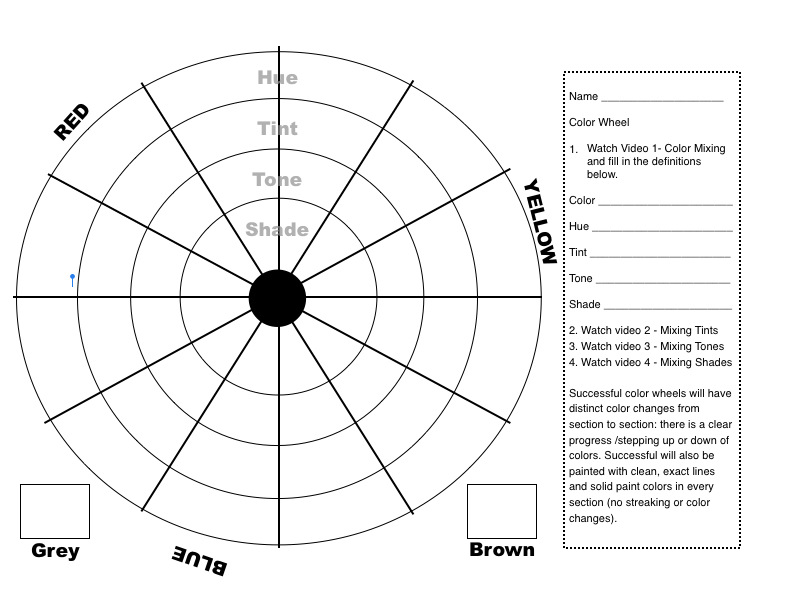 Using the handout and videos provided, please mix and paint a color wheel that includes tints, tones, shades and the pure hues. Paint is limited to black, white, red, yellow and blue. You will also mix the color brown and grey using only the 5 colors provided. Brown is created by mixing red, blue and yellow. Grey is created without using black by mixing blue-violet, yellow and white. There are 4 videos that demonstrate each step. Start with Video 1 - Color Mixing and follow the directions. Once you have completed all the steps in the first video, you move on to the 2nd video - Mixing Tints and complete the steps found in that video. Continue watching the other videos painting the steps in the video before moving on to the next.